Wilshire Boulevard, Los Angeles, California. Ron, I love your photos of Los Angeles. I live here, and to be honest, it is a pretty ugly city. You’ve managed to find little bit of grace that there is in this city! I love this photo of the Wilshire Corridor. 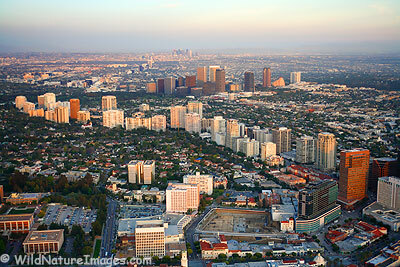 I live near here (in Westwood – near UCLA) and I’d never seen an aerial view in this direction before. Very nice. I represent the West Coast Friends of Laniado Hospital. If it would be possible to use your photo in an ad for a hospital in Israel. I am trying to draw a contrast between Wishire Blvd. , our local office is located there, within a fifteen minute drive one can find at least 10 MRI Centers while in the city of Netanya, coast city between Tel Aviv and Haifa serving 500,000 residents there is not one MRI. Hi Urie. I thought I had left a comment but I don’t see it. It would be best to email us at info@wildnatureimages.com.